You are in customer acquisition phase and your competition is out to kill you. The problem you are solving is also being solved by multiple other players in your market. You want to differentiate yourself from the clutter but that looks nearly impossible and you find yourself drowning in an ocean of me-too products. Online services offering budget hotel stays in India are increasingly finding themselves in the same boat. Yesterday, May 14 saw Oyo Rooms – a startup offering budget hotel stays – launch its mobile app at the India Habitat Centre in New Delhi. Coincidentally, or perhaps to hijack its event, Zo Rooms, another startup in the same space, chose the same venue for its meet. 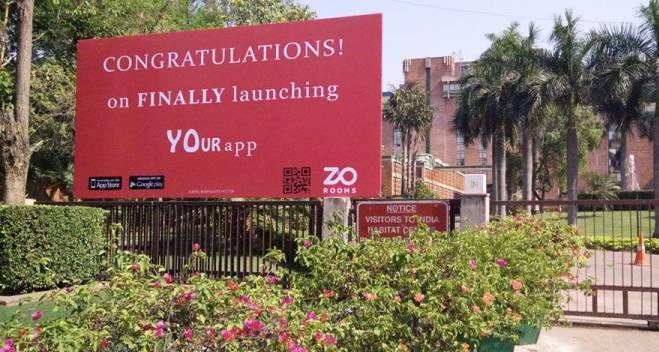 In a classic case of derived ambush marketing, Zo put up billboards and standees to convey some cheeky compliments to Oyo rooms. The below image shared by NextBigWhat is proof of Zo taking on Oyo at its own event. More images at the link. A little back story: Last month, Oyo Rooms took Zo Rooms to court over allegations of stealing its copyright material. However Zostel Hospitality that launched Zo Rooms has denied the allegations, calling it a fabricated move by Oyo to kill competition. Not one to keep quiet, Oyo Rooms took to Twitter to troll Zo Rooms along with an army of supporters, later in the day. It began the trolling by sharing cheeky visuals taking a jibe at Zo, while Twitter supporters successfully trended a specially created hashtag dedicated to Oyo’s trolls – #OyoLovesTrolls. Oyo offers a feeding bottle to the new baby. Oyo shows who’s the daddy. Oyo shows-off its test report. Fierce competition, a desire to appeal to millennials, a strong need to look ‘cool’, one wonders what’s driving these internet companies to troll their competitors on social media. Oyo Rooms claims to have 30K app downloads, which can be verified from Play store, while Zo, the newcomer is in the 1K-5K range. Incidentally, Oyo Rooms was at the receiving end on Twitter this March. Stayzilla, an online marketplace for stays, accused it of trademark violation in its Google Adwords Copy. Stayzilla repaid with highly witty #OyoMama tweets that Oyo Rooms found almost impossible to combat on Twitter. Read “Stayzilla Fights Trademark Violation By Oyo Rooms With Witty #OYoMama Tweets“.